Do you want to beat the heat this summer? Although our guests enjoy spending the majority of their time exploring Helen and all of its fun attractions, many have enjoyed taking a brief day trip south of Helen to Buford, GA in order to visit Lanier World on scenic Lanier Lakes. 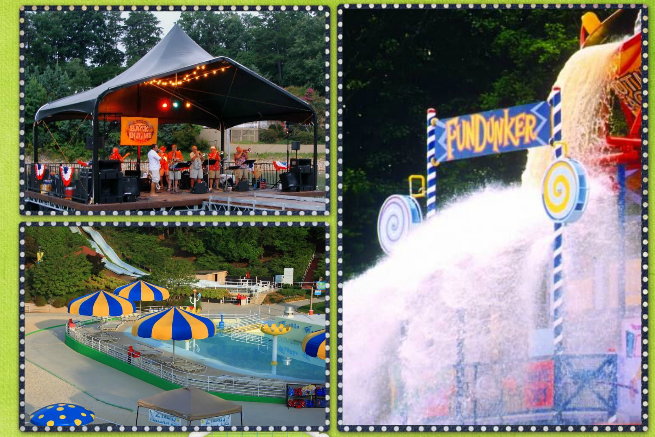 Despite the fact that the water park is slightly pricier than Helen's own water park facility or tubing excursions, many groups of families and friends feel that the unique slides and experiences available at Lanier World make it well worth the investment, as they spend a day bonding together and staying cool. If you're interested in making the trek, read on to learn more. The Lanier World Water Park located within Lanier Beach & Resorts is a fun place to spend the day before heading back up to your Helen cabin. Regardless of your age, there are rides and attractions that are designed to keep you happy and having fun while beating the heat of the summer months. The park features several different distinct areas, including the Family Fun Park, Big Beach, and Sunset Cove. Depending on where you choose to spend your time, you'll enjoy 9 different water slides of varying degrees of thrill, a wave pool, a lazy river for tubing in the cool waters, a raging river for a more turbulent and river rapid experience, kiddie water fun areas, and even restaurants where you can fuel up before getting back into the water. There are also lots of games for you to play while you're waiting off that "30 minutes after eating" so that you don't "get a cramp". For those with little ones, you might want to plan to spend the majority of your day at Big Beach. Kiddie Lagoon is a children's paradise, teaming with spraying water effects and water slides that aren't too intimidating for their size. Wiggle waves is also available, which provides a scaled back and "mini" wave pool experience for those who may not be as seasoned in thew water. A relaxing beach area is available for parents with kinds old enough to allow their children to swim in the lake beach that is lifeguarded for safety. And if your young ones are feeling especially brave, they might try the "Twister" slide, which features a number of exciting twists and turns, the "Typhoon" which is for single and double riders, or the "Triple Threat", which offers 3 exciting drops. Only the most seasoned riders might consider the "Intimidatory" which starts off slow before the bottom completely drops out. It's a free fall to the bottom! Looking for more of a thrill? 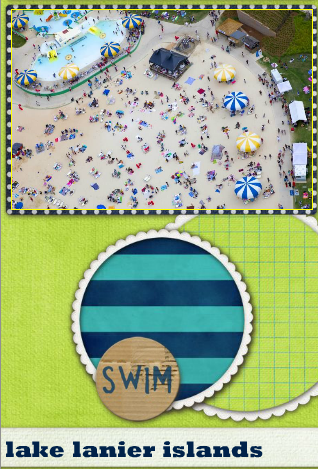 Head over to the Family Fun Park which features the WildWaves Pool. You'll feel like you've really hit the beach as you glide over the generated waves and enjoy the experience with family and friends. Many folks enjoy the peaceful sensation of gliding along the lazy river, but you can also challenge yourself agains the rapids and sharp turns of the Raging River. When you need a break from the water, Sunset Cove is all about the dining and shopping experience. This is a great place to relax and unwind. At the end of the day, regardless of which area of the park you dedicate your time to, be sure to stick around for Beach Flicks Nights…the 200 foot outdoor screen at both WildWaves and Big Beach enables visitors to pull up in a tube or recline on a beach lounger in order to catch a Blockbuster hit. It's a "drive in" like no other! Lanier World Water Park caters to the whole family. Offering a kiddie land that is suitable for youngsters who are just learning how to handle the water, as well as advanced water slides for thrill seekers, everyone will find something to love! Best of all, lazy rivers, wave pools, and shopping & dining experiences offer a "common ground" where the whole family can come together to have fun and make memories. Daily admission for adults is approximately $36, whereas those under 42" tall, seniors, and veterans pay only approximately $26. Children under the age of 2 years old are free. Be sure to bring your own towel and sun screen in order to protect your family and save money. Should any items be forgotten, they can be purchased in one of the parks shops. Lockers are available in order to protect all of your belongings throughout the duration of your visit. Have you or someone you know visited Lanier World in the past? What tips and advice to you have to offer to our future Helen guests? Share your input in the comments section of our blog.